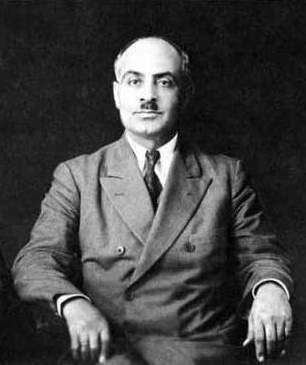 Garegin Njdeh (Armenian: Գարեգին Նժդեհ, real name: Garegin Ter-Harutiunian, 1 January 1886 - late 1955) was an Armenian statesman, military, and political thinker. He was a native of Nakhchivan. Njdeh fled Armenia after the triumph of Bolsheviks, and was involved in patriotic activities in Iran, Bulgaria and the United States. A controversial person, he was expelled from Dashnak party. Njdeh was very much against communism. He worked with Nazi Germans during the World War II. He was arrested in Sofia, Bulgaria in 1944 and sent to Moscow, then to Yerevan. He spent the rest of his life in prison in the Russian city of Vladimir, where he dide in 1955. Garegin Nzhdeh during the Balkan Wars, 1912–1913. Garegin Njdeh Facts for Kids. Kiddle Encyclopedia.